← What are you doing in October? The garden that is finished is dead. I have a friend who is often heard to say about her garden ‘if it was finished I’d keep on top of it’. Gardening is like housework or painting the Forth Bridge – although I believe they have actually stopped (finished?) painting that now. Being a transient-married-to-military gardener, I have worked my way through seven gardens and a balcony of pots in the last nineteen years. The balcony of pots was a traumatic time for me – we had just been posted to Hampshire from Peterhead in Scotland … to a maisonette! Oh how I sulked. And to add extra sulk to my sulking we were put in the upstairs maisonette (no garden!) whilst those below us taunted me with the sound of their lawn mowers and of digging. Across the busy A325, a road which cut through the married quarters patch, were the houses – with no one on top or below them and each with their own garden and small driveway. I would have to face those houses every time I stood at the kitchen sink to wash dishes – so cruel, why couldn’t I have a garden. The trainee under-gardener decided he would have to apply to move us over to the houses-with-gardens side of the A325 for the good of his health and hearing. He is nothing if not wise! Knowing this could take ‘for-ever’ even if at all – I set about putting pots on the balcony. Oh what fun we had lugging bags of compost up the two flights of stairs, a task which would continue for six-months. Tiny garden but bigger than a concrete balcony! Notice arrived to say that we could move across to a house with a garden. Oh so happy was I, even though that garden was the tiniest garden we have had in our nineteen years. But hey, it was so much larger than a pot on a balcony. Our first garden, after we married (in 1993) and moved into quarters was at RAF St Athan, South Glamorgan. 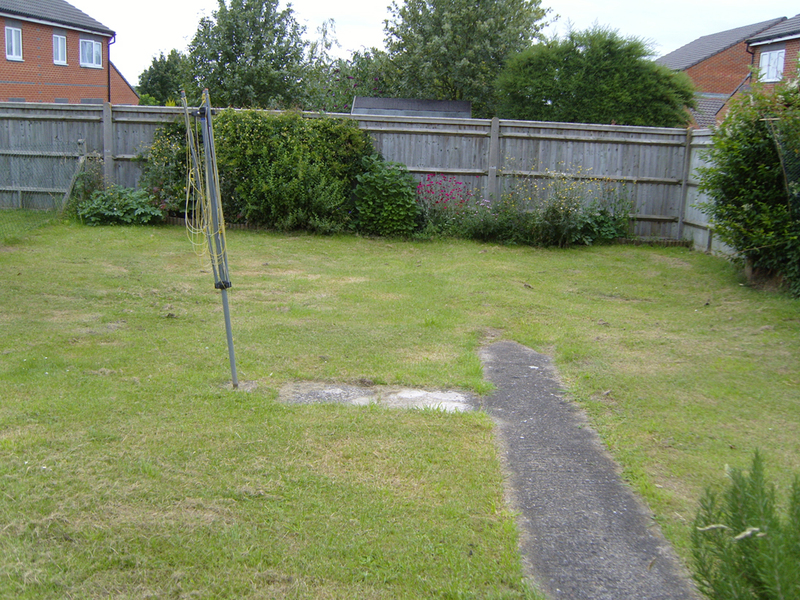 The garden was a delightful little 60s style square of lawn with thin strips of bedding edging it. Being a plants-woman, I wanted to rip up the small lawn and fill it with tiny twisting paths and flowing planting. What! Why? Surely someone, the next occupants, would welcome a ready-made garden. Not so. I now know, after all these years of transient gardening that I am a rare breed. Posting to Scotland came within three years of me living with that sweet little lawn in RAF St Athan. RAF Turnhouse, Edinburgh was the next stop, albeit a very brief 6-month tour as the unit was being closed down. 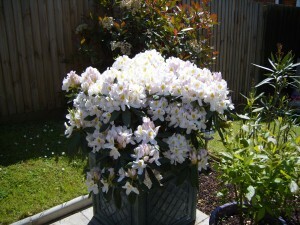 No sooner had we unpacked the kettle and I had made plans for some gardening therapy when we were re-packed and on our way to RAF Buchan, Peterhead. ‘There are no trees on camp there, they tried planting some many years back but they kept blowing over’ he says. I had trouble imagining an RAF base without trees, but he was right – no trees! Bleak is the word that could be used to describe the area, but I found it beautiful in a way that was so opposite from my beloved Cornwall that I left on marriage. Our Peterhead quarter was stunning, two bathrooms and three toilets between two people! The huge garden was lawn from edge-to-edge with not so much as a tiny border. The environment was very different to what I was used to so I needed to investigate what to grow – during which time my gardening consisted of nothing more taxing than grass cutting, albeit a three-hour session each time. Having decided on how I was going to garden in that harsh environment – posting notification arrived … to Hampshire … to the ‘Balcony’ … so you can understand my sulking. 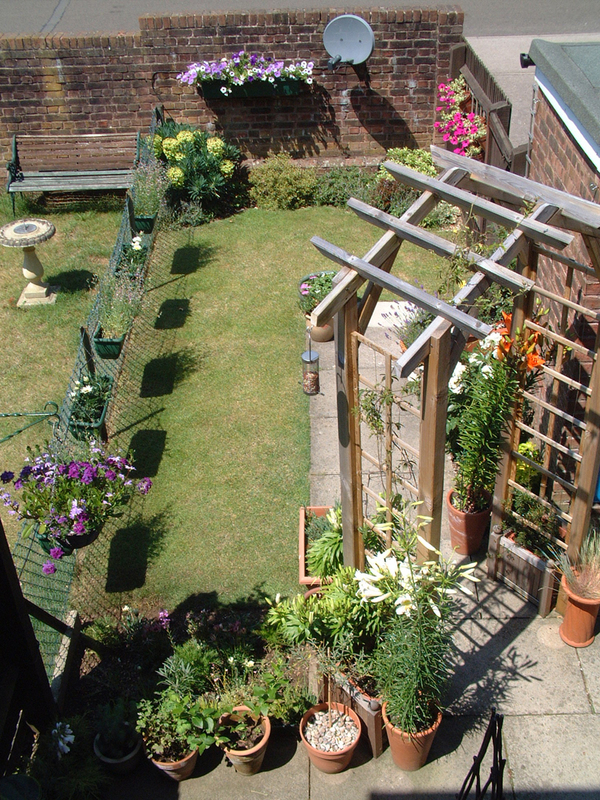 From a three-hour lawn cutting garden to a balcony – how cruel! Unusually, we stayed at RAF Oakhanger, Hampshire for almost seven years – then it was on to RAF Northolt where the first patio-build began. The patio area was built then – yes – posting notice arrived and off we skipped to RAF Benson, Oxfordshire. I could see him pale and his legs bend slightly, in his mind he was already carrying the sand and slabs (I helped!) through to the back garden. 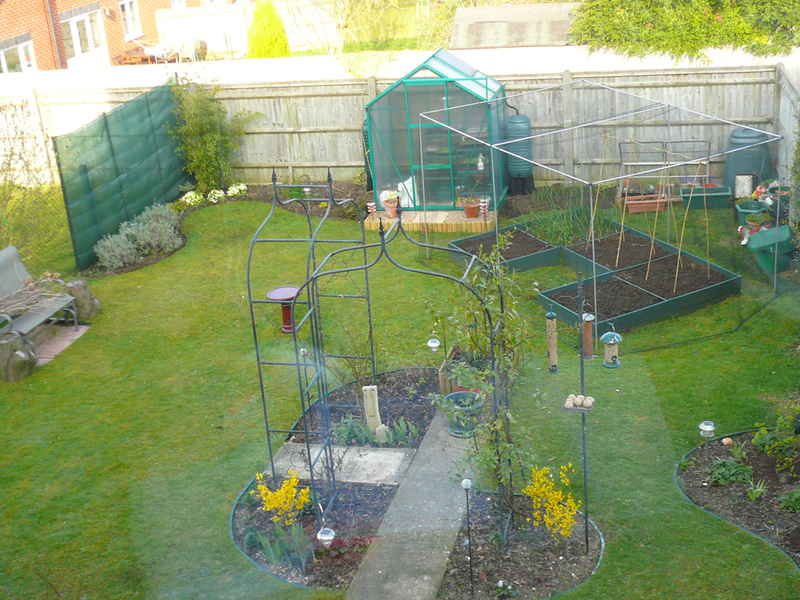 The patio area was built, beds were dug and this time a greenhouse was concreted (RAF bases are notoriously windy!) into the ground. ‘We’re posted to RAF Henlow in a couple of months’ he said. ‘What about my greenhouse?’ I said. ‘I shall have to dig it out and make good’ he said calm as you like. My non-gardening friends watch him in amazement, knowing that he too is not a gardener. Our current garden at RAF Henlow had no patio on arrival, it now has a patio – I do hope all the occupants that follow me are pleased with all the beds, borders and patios I have left in my trail.